… if I did, in fact, go ahead & kill myself, where, oh, where would all the people live? 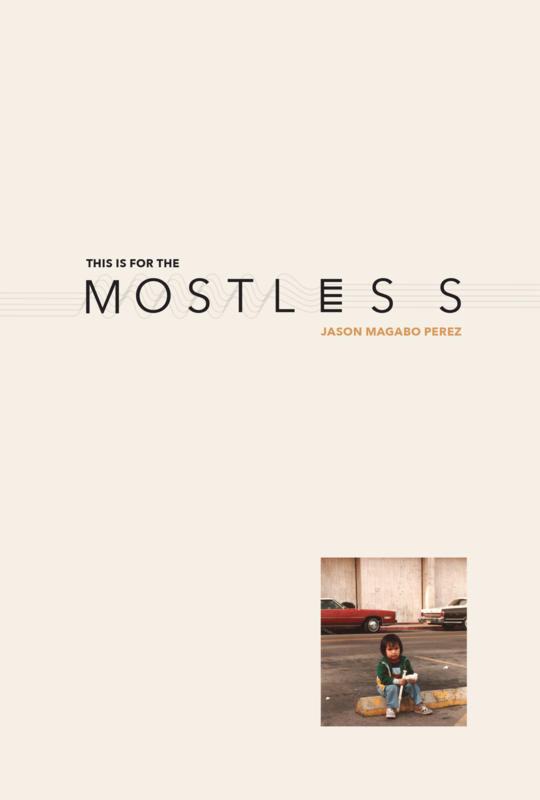 The poems in Jason Magabo Perez’s This is for the mostless are constellations of arrivals and departures, tales of a movement that almost never landed because the destination never wanted Filipinos here. As brown Asians, as Filipinos who make up one-fifth of the total AAPI population: this makes us the mostless. Jay and I are friends, too (I will sometimes call him Jay, as I draw from our personal relationship, and I will occasionally name him as ‘Perez’ where it fits him, as the author.) I care about his well-being, family, friends and tenure-track life after adjuncting for as long as I’ve known him. I care about the characters, these real-life people: the 9-year-old speaker, Elaine Joy De La Cruz, Fortunata A. Perez, Epifanio, The Girl Who Fills Her E’s, Tupac, Tookie Williams, Edwina, the ipis, Jay’s beautiful nephew. And I care about how Jay placed Michel Foucault and Dead Prez together in the same paragraph, regardless of the seemingly endless borders guarding genre as something fixed. I bring all of this up because my read and review of this gorgeous book is years, friendship and literary citizenship in the making. My read of this book existed before the book, and I have always known Jay to be a writer through his activism, poems, questions, plays, voices, theorizing and performances. I recognize some of the major themes and players from his chapbook, Phenomenology of a Superhero (Red Bird Chapbooks, 2016), in which he writes to and about his nephew. the feelings you have at school. You’re ready to tell Auntie your secret. These love letters written from Perez as an uncle to a young boy are a textual and literary embrace. Perez writes with a tenderness that masculinity could be. I appreciate the honesty that mirrors what young boys and men of color may not often have the intimate space to speak from. Perez also speaks to these futures and pasts: “I wonder if you, too, remain perplexed & stuck about your approximation of Black masculinities, your desire to know them, your romanticizing of them, your appropriation of a commodified form of them, your privilege of not being a Black man or woman in America.” Perez shows us the ways in which young Filipino boys navigate their relationships to anger, violence and growing up. He acknowledges how these boys share experiences with black folks but are not viewed through a lens of solidarity, but difference and distance instead. Perez’s characters include his older brother and his gangster friends who are sometimes his bullies. He also asks, “Despite this, are you, too, committed to thinking deeply about why Pac could mean so much to you & yours?” and “I wonder if it still upsets you when people claim that Tupac is alive.” A “wonder” is almost an unanswered thought, not quite a wish, but somewhere between a need to know and a need to just say it. Wonders are still empty but worth asking. Some of the wonders break open, spill in to today, like when Perez asks,“How did you feel about the hologram at Coachella?” What mourner doesn’t want to see their beloved dance in and out of the afterlife? And to dance and be well in this life, but in the flesh? Perez’s voice embodies versions of selves as if they are different lived lives. His work is, for me, reminiscent of another renowned writer from Oceanside, CA — Victor Villaseñor — who works with writing in a way that amplifies the lively parts of oral histories. Both writers write openly about crying often and are candid even about not crying. Perez offers us these love letters, lets us wonder, too. Perez works with and writes to the spirits of past times. By focusing on oral histories, especially in the prose, “Stranger Here: Oral History (U.S. v. Narciso & Perez)”, in which he positions the text at the bottom of the page, creates an almost-picture framing Polaroid form without the picture. He has often written about the 1976 case, U.S. vs Narciso-Perez, where the FBI framed his mother and his auntie of poisoning patients in a VA hospital in Ann Arbor, MI. He includes his mother’s words in this found text: “ … I’m a human being di ba even if I am just immigrant here I’m a human being di ba.” I remember when my cousin April showed me the front page of the local newspaper where her mother and auntie, stationed and working in Ann Arbor at the time, were holding protest signs highlighting the injustices against Filipina nurses like them. Jay documents and archives like a historian, detailing the purpose of the everyday. He gives space to the voice of his immigrant mother who also punctuates questions as wonders. This is an act of resistance and talking back, but ultimately, it is an act of love between family — an act that occurs when so much is taken from you and yet the loss still grabs at your narrative. Perez’s oral histories write against notions that have made him and maybe even you, the reader, complicit, or even worse, unaware that these stories even exist. Such are the stakes of writing to Joy — Elaine Joy De La Cruz, a (best) friend of the author who passed away in a car accident / who left unexpectedly. I need to write about “What Saddens Sardines: A Romantic Query” as it is and is not a love prose poem/love story that documents love in all of its everyday and everynight details. It’s a description of a partnership that is careful, close, teaching. These are dispatches from inside: “She caresses my arm & I stop thinking. Planes fly & don’t soar overhead. I want to scream louder than the planes. This is real.” This query is from a tightly sealed but bigger world than we (readers) can peer into — this is the foreground of a relationship with The Woman He Loves The Most that is constantly building and living. I’ve been fortunate to know Jay as the writer and Perez as the author and as a fan sticking to their predictions about wanting a MacArthur Grant for him one day. This is the beauty of writers growing up, growing into writing and community and letting stories turn pages and take their time on stages before they gather into a book. In This is for the mostless, there is an archive of some of his major life moments that speak to a Filipina/o/x America that will take the forms of poetry or fiction & not, autoethnography & not, while reimagining strategies and discussions for ultra creativity, ultra realness. Janice Lobo Sapigao is a daughter of Filipina/o immigrants. She is the author of Like a Solid to a Shadow (Timeless, Infinite Light, 2017) and microchips for millions (Philippine American Writers and Artists, Inc., 2016). She is a VONA/Voices and Kundiman fellow and the associate editor of TAYO Literary Magazine. She co-founded Sunday Jump open mic in L.A. She earned her M.F.A. in Writing from CalArts.